The other extra connexion on the ATX 20pin connectors are just ground and the green wire that is "Power on" so that motherboard can start and stop the PSU. That isn't the 4 pin I was talking about - I think. There is that other white 4 pin near the front of the card there the incoming DIN power plus is. I though one theoretical option that you mentioned was to just bridge two cards using a 4 pin to 4 pin connection. That is theoretically possible, correct? Is there any practical reason why you have found that doesn't work? The 4 pin white connector near the input 4 pin din is the same as the 4 pin din and is for input voltage and when I use 2 PSU I connect this two P4 white connector together so that both PSU are supplied with power from the same brick even if I insert the brick only in one PSU. Yes I was talking about connecting the 4 pin Molex from both PSU the molex conector contain the 12V and 5V. But I still need to connect the power on wire on the both PSU and for this I needed an ATX cable that also contains the 12V and 5V so it was not necessary. I do not understand why will you want to have the power output connected together when you can split the power for diverse component and you can use all available power. Right now in my computer the power from one PSU is used for MB and video card and the power for the other PSU is used for CPU and HDD and this is the best solution. I am just trying to understand what you are doing. I also like to keep things simple and crude. It looks like you when with the 20 connecctor bridge route, but pulled everything but the 12 volt wires, the ground and the power on wires. And then are using each board to power something different. If they are each powering something different, seems like you should be able to just get by sharing the 12 volt connection through the 4 pin to 4 pin connector. That seems simpler than using a specially modified 20 pin ATX Y cable. There must be an advantage to doing it the way you are doing it with the modified 20 pin ATX y cable - but I am not seeing it. The 12V is not shared. and input voltage for this PSU is 18 to 28V. The ATX cable is only needed for the Power on wire there is no easier way to connect the power on signal (I do not want to solder a wire from one PSU to the other). I don't think I fully understand. But you are the expert, so I will just accept what you say. When are you going to have your new 120 x 2 setup ready to ship? Sorry I,m not to good at explaining so I did for you a drawing see picture below that should explain better. As you can see the PSU "A" is suppling the motherboard and video card and the "B" PSU is suppling the CPU and HDD & ODD. The only electrical connexion between "A" and "B" are GND, Vin (18 to 28V) and PowerON the green wire no other connexion exist between "A" and "B"
I need to modify some ATX cable and then will be on eBay. If you want to modify the cable by yourself then I can sell right now. As you can see the PSU "A" is suppling the motherboard and video card and the "B" PSU is suppling the CPU and HDD & ODD. So the 4 pin to 4 pin cable on the left is supplying ground and 12 volts to both power supplies. So apparently immediately prior to this part of the circuit, the board must step down the incoming 24v power. Can you answer those these questions or comment on what I think I see happening? PS: Performance-PCs has a similar 24 pin y cable. 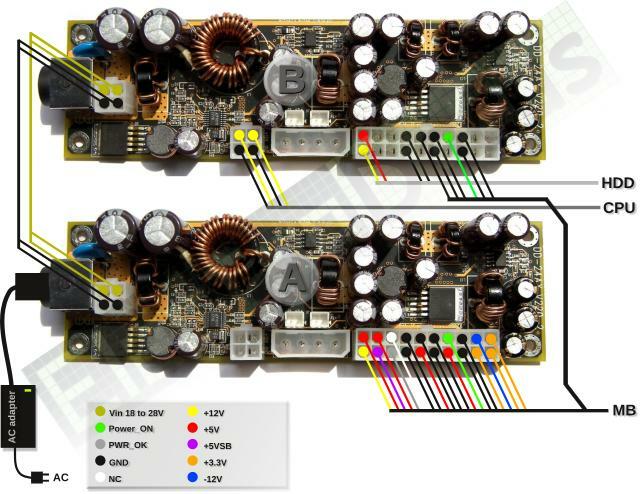 They are allegedly the inventor of the first modular power supply and pride themselves on cabling prowess. If you approached them as a vendor who is going to be buying a lot of there they will probably make them special for you - and even let you order it in small counts as you need it. Half of energy goes to HDD+CPU, another half to MB -- yeah, that's a good balanced scheme. You can insert into MB things like ATI Radeon 5670. Nice twinning, electrodacus! Let me respond, please. That's because electrodacus tried to put rails together (very risky, why?!) Now he divided power into 2 directions (hdd+cpu, mb+gpu), and the problem is gone automatically. As for seven ground wires -- hey, after removing all unneeded wires (see pic, B one) the ATX-connector will remain totally peeled -- let's leave him some GNDs at least Store is no sore. The 4pin to 4 pin cable on the left are supplying GND and 20V in may case (can be 18 to 28V) depends on your monitor but the color in the schematic is not Yellow as for the 12V is a different color closer to bronze and that represent Vin that can be 18V to 28V. 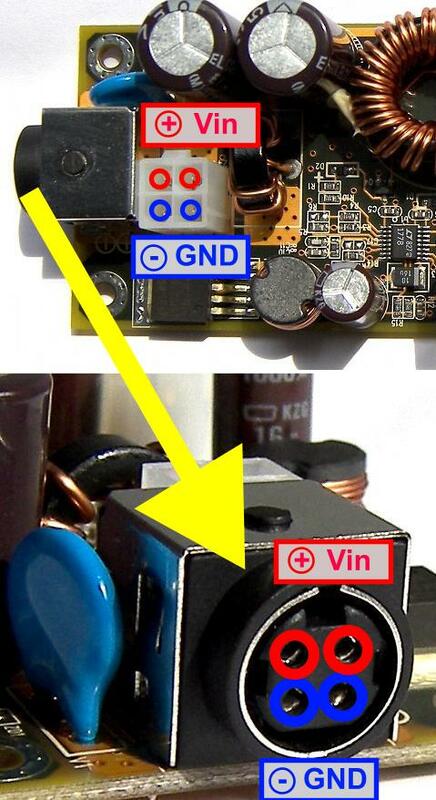 The biggest coil on the board is responsible for converting the input voltage Vin (18 to 28V) in to 12V. 1.More GND connexion is better do not want to enter in details and is easier for me not to remove them . 3.Look closer at the drawing and photo the 5V and 12V wire from the 20 pin ATX conector + two GND wire are used to supply the HDDs and ODD see that this wires are just going to an SATA power cable and a 4 pin Molex power cable. There is no connexion from one board to the other for 12V or 5V just zoom the photo to see better. Thanks Ksanderash you can use any graphic card that dose not use an external power probably 5670 is one of the best right now.